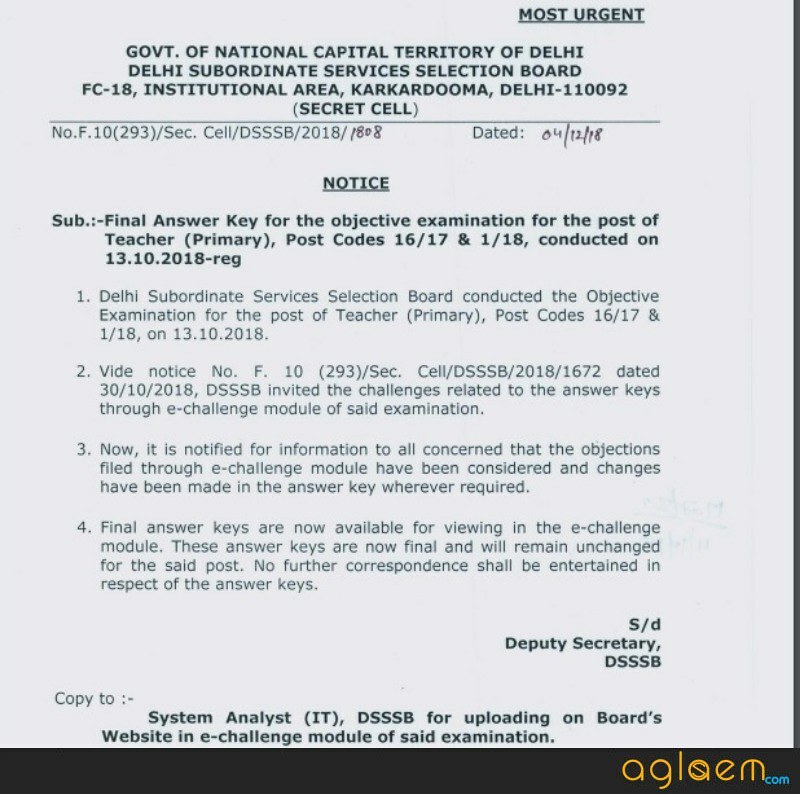 Delhi Subordinate Services Selection Board (DSSSB) has released the DSSSB Teacher (Primary) Answer Key 2018. DSSSB has released the answer key on dsssbonline.nic.in. Those who have appeared in the exam can check their answer key by entering application number and date of birth. The answer key is too essential for those who appeared in the exam, as an outcome is the primary concern of candidates after appearing the exam and answer key do so.The aspirants can cross check and can estimate the chances of selection through DSSSB Teacher (Primary) Answer Key 2018. Check here more details about the DSSSB Teacher (Primary) Answer Key 2018 here like, a method of calculating marks. Latest: The Final Answer key of DSSSB Teacher 2018 Exam has been released. Scroll down to access the answer key link. Answer Key: Click here to download the DSSSB Teacher (Primary) Answer Key 2018. How to Download DSSSB Teacher (Primary) Answer Key 2018? Board has released the Answer key on the official website at www.dsssb.delhigovt.nic.in. The aspirants who have appeared in the exam can check the answer key on the official website. 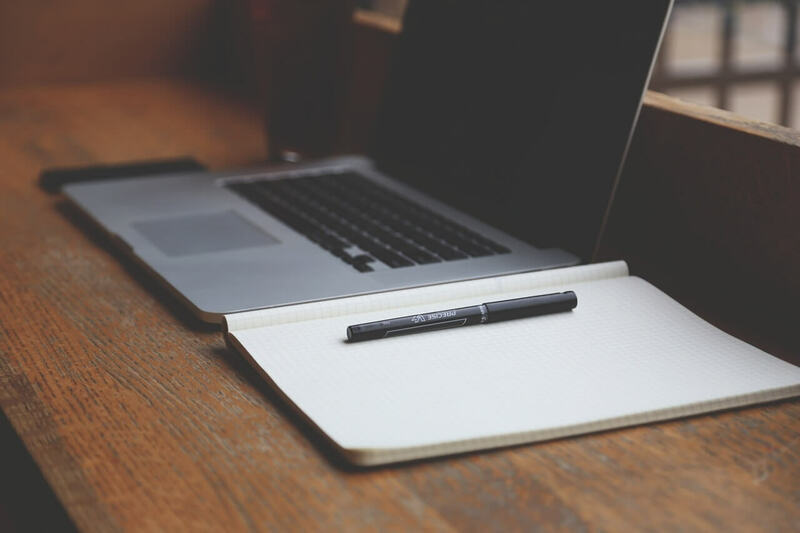 Aspirants can simply check their answer key by following these steps. First of all, aspirants have to click on the above link. This link is direct and redirects you to on answer key page. The answer key is accessible through the login, the candidates have to enter the application number and date of birth. The basic purpose of releasing the answer key is to remove the confusion of the candidates about their exam. Because it takes more time to validate the answer sheet for all candidates. Releasing a single answer key can remove the confusion and allow the board to process the result. By doing so bard will get extra time, so in the meanwhile when candidates are busy with the answer key, the board can prepare the result. 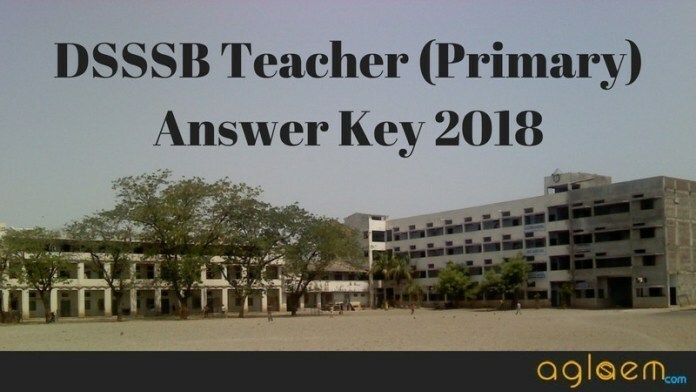 How to Use DSSSB Teacher (Primary) Answer Key 2018? After downloading the answer key you should know the use of the answer key. The use of answer key is totally dependent on the marking scheme. I know you guys are aware of marking scheme but still, here I am providing the marking scheme again. 01 Marks will be awarded on each correct answer, and On the occurrence of an incorrect answer will lead the deduction of 0.25 marks. Nex, know how to calculate your marks form the answer key. How to Calculate Marks form DSSSB Teacher (Primary) Answer Key 2018? Now to calculate your marks you should look out at this formula. This formula will give you the correct answer. get set go to calculate your marks. At last, after releasing the answer key, the board will declare the final result for DSSSB Teacher (Primary) Answer Key 2018. So, who so ever will have the issue regarding the answer key, will be resolved by the answer key. 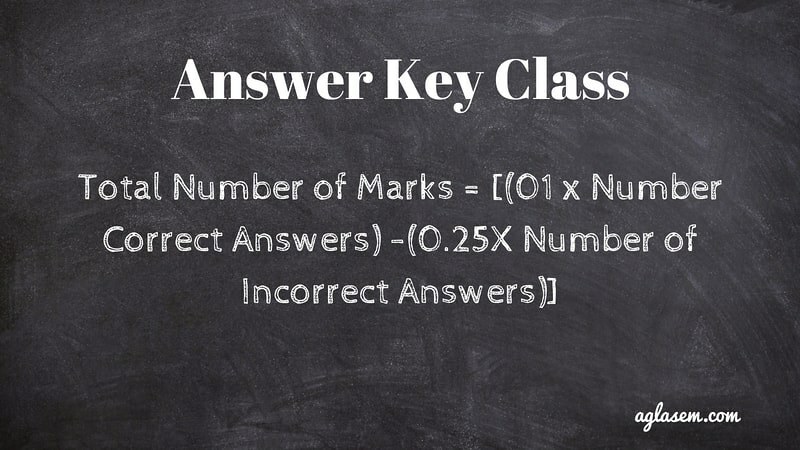 Because many a time answer key became the reason for extra confusion, as from the point of view of some of the candidates answer key will be correct and by other’s it will be incorrect. So don’t worry wait for the final result. Board will declare the result on the official website on dsssbonline.nic.in. In order to check the result aspirants need to enter the login credentials on the official website.